From the Hanashi Oral History Project Archives, recorded July 26, 2006. Born in Honolulu, Hawaii in 1927, Ralph Shigeto Iwamoto is possibly more widely known for his work as an abstract expressionist artist than his military service. Similarly lesser known in the narrative of the Nisei soldier is the unit in which he served during the Allied Occupation of Japan from 1945 to 1952. Iwamoto was a member of the 441st Counter Intelligence Corps Detachment stationed in the Second Region of the Counter Intelligence Corps, Area 26 or Saitama Prefecture. During his service in Saitama, he was involved with information-gathering and community relation activities. He was often sent to political demonstrations where he mingled with Japanese civilians and tried to blend in wearing his kimono. Lightheartedly, he describes employing a friend to help him translate the speeches at these demonstrations. As a young nineteen year old, he was charged with interpreting highly specialized military language as well; this baffled him. His charge was about taking the pulse of civilian life and activities and building relationships with local officials and authoritative figures. Photos collected by Ralph Iwamoto. Ralph Shigero Iwamoto oral history interview, July 2006. Iwamoto’s artistic profession and his military experiences aren’t highly investigated in the somewhat linear telling of the Nisei soldier narrative. As someone involved in making these stories known, Iwamoto’s oral history caught my attention when I found a representation of his painting Eastern Twilight. I immediately questioned how his military experience and culture influenced and shaped his work, his identity and the identity of his artistic expression. Did it at all? What did Japan look like thru the eyes of an artist and soldier? Perhaps Iwamoto’s interview doesn’t offer the clearest of answers to these questions; perhaps his use of the octagon as the source shape for his more abstract work, as he suggests, doesn’t have any profound relationship with his personal story. But, to paraphrase what knowledge he offers at the end of his interview: tell your own truth. His truth and his story is more than creating art or being a soldier, it is about staying true “to that thing that is in [him], that’s [what] you have to do.” In sharing his story, in creating his art, perhaps he does in fact widen the truths of the Nisei soldier experience and the artist as well. Our collection of oral history interviews has literally thousands of powerful quotes, stories, lessons, and anecdotes. The above is one of my favorites. It comes from World War II veteran Henry “Hank” Yoshitake, who was in Company A of the 100th Battalion of the 442nd Regimental Combat Team. One of the most difficult things to do is to realize that our “heroes” were and are just ordinary people. Yes, they showed courage that most of us cannot even imagine, sacrificed their very lives, and made America the country that it is today. But they are also just normal men and women, often who have faced many of the same daily joys and sorrows that we ourselves face. The men of the 100th, 442nd, and MIS were not superhuman, even though their actions often seemed as such. That is why I like Mr. Yoshitake’s quote so much. He is aware that most people view him and his fellow veterans as untouchable heroes in the community, up upon pedestals and out of reach. They are seen as unapproachable: heroes to be praised, not simple friends to start up a conversation with. And it saddens him. Because so many younger people see him as a “hero” and not as a “normal person” like themselves, they are often too intimidated to start up conversations. And in this disconnect, the history fails to be passed on. Sure, the lore of the veterans’ accomplishments lives on, but the very human struggles that they overcome are forgotten within simple hero worship. To me, Mr. Yoshitake and his fellow veterans become even more heroic when I remember that they are just ordinary people like ourselves. They had no superpowers, which would have made their job easy. Instead, they relied upon their own astounding courage, valor, and character. Victory was never assured. Their job was never easy. And yet they still overcame all of these difficulties with a bravery and perseverance that should be a model for all people. They were normal young men, and their astounding valor and heroics should be an inspiration to us, proving that we can act likewise in whatever endeavors we face. So please, listen to Mr. Yoshitake’s advice. Talk with the veterans. Start a conversation. Listen. Sure, we should still call them “heroes,” because they are. But we should also call them “friends.” They are our grandfathers, our uncles, our neighbors, our pals. Pull up a chair and start a conversation with them, and learn their story. It truly will astound you what ordinary human beings can do! The 442nd/100th to the Rescue (of the “Lost Battalion”)! I have just finished working through an interview with Hideo “Lefty” Kuniyoshi, a Nisei soldier from Hawaii. During World War II, Mr. Kuniyoshi served as a squad leader in the 442nd Regimental Combat Team, and he saw much action in Italy and France. Sadly, in reading a little bit about Mr. Kuniyoshi, I discovered that he suffered from Alzheimer’s, which would explain his foggy memory in parts of his interview. One area in which Mr. Kuniyoshi’s memory is still intact is his service with the 442nd in Europe. Mr. Kuniyoshi saw action during the Champagne Campaign and the battle to break the Gothic Line, as well as helping to liberate the city of Bruyeres, France. One famous mission Mr. Kuniyoshi took part in was the rescuing of the so-called “Lost Battalion”. Always humble, Mr. Kuniyoshi does not like to be branded a hero for his contribution to the mission, instead maintaining that he was simply performing his duty for his fellow brothers-in-arms. The case of the Rescue of the “Lost Battalion” is an interesting story and I have come across it in several of the Nisei veterans’ interviews. I would like to give a little background history for the mission and how it relates to the Nisei military experience. The “Lost Battalion” was a group of soldiers from the 141st Infantry Regiment, 1st Battalion of the 36th (Texas) Division, which originally made up the Texas National Guard. Fighting through France in October of 1944, the soon-to-be “Lost Battalion” was ordered to engage a group of German soldiers, by the much maligned Major General John E. Dahlquist. The battle was a disaster: German soldiers were able to cut-off the battalion, leaving 275 soldiers trapped without supplies in the Vosges Mountains. Two rescue attempts failed and conditions on the ground quickly deteriorated. The 442nd Regimental Combat Team was called upon to undertake a final rescue mission after their success in the French towns of Bruyeres and Biffontaine. During the five days of battle, the 442nd was able to break through and defeat the Germans, rescuing the remaining 200 men of the “Lost Battalion”. In the process however, the 442nd suffered hundreds of casualties. The “Lost Battalion” mission contributed to the 442nd becoming the most decorated unit, for its size and length of service, in U.S. history. Missions, like that of the Rescue of the “Lost Battalion”, highlight the importance of the Japanese American 442nd Regimental Combat Team and 100th Infantry Battalion during World War II. The Nisei soldiers’ service shows the selflessness and loyalty that many, like Mr. Kuniyoshi, operated under for a country which treated them poorly. This mission also highlighted the suspect leadership of Major General Dahlquist, who was criticized for his over-utilization of Nisei soldiers, many of whom had little rest after liberating Bruyeres and Biffontaine when called upon for the mission. I have come across several Nisei veterans in these interviews who do not hold the major general in high regards. Mr. Kuniyoshi, for one, when asked about what he thought of Major General Dahlquist responded with the curt reply, “not much”. Some argue that Dahlquist’s actions may highlight the inherent discrimination and racism in the military during World War II, and sadly racism against Japanese Americans permeated the whole country at the time. This is what makes the service of the 442nd/100th and missions, like the Rescue of the “Lost Battalion”, so important, for it signifies the Nisei veterans’ legacy. 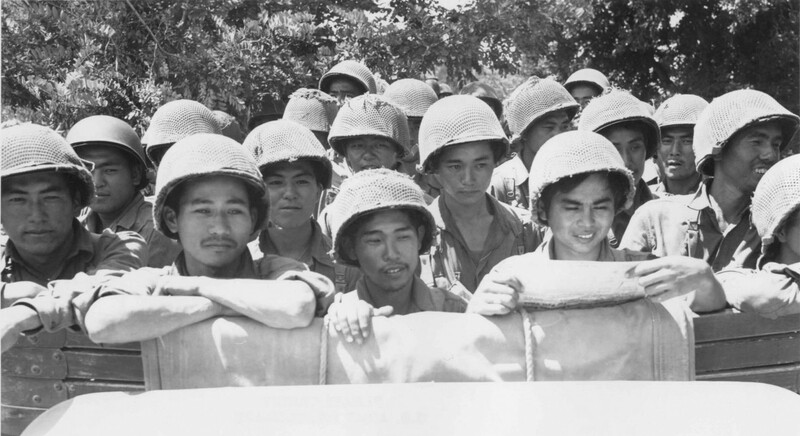 The Nisei fought to prove their loyalty to their country, as well as to gain honor and respect from the American people. The courage and resolve that Mr. Kuniyoshi and thousands of others have showcased is something to be admired and has rightfully cemented the Nisei soldiers’ actions during World War II as an important piece of American history.